HANOI – The number of foreign laborers coming to Vietnam has steadily increased in recent years, surging to over 88,000 workers at the end of 2012. The large majority of foreign workers that come to Vietnam are employees of foreign contractors, working for, or establishing, foreign direct investment (FDI) projects. 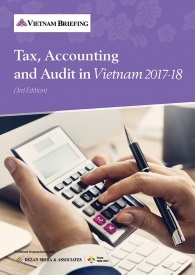 A Vietnamese entity is permitted to recruit foreign workers in order to work as managers, executive directors and experts where local hires are not yet able to meet production and business requirements. Unlike in certain other Asian countries, Vietnamese representative offices are also able to hire staff directly. To demonstrate the necessity of a foreign employee, thirty days prior to recruiting the foreign employee, the entity must publicly announce recruitment for this position to Vietnamese job seekers in a Vietnamese newspaper or online portal. Evidence of this announcement must be presented in the application for a work permit for a foreign employee. The other option is to recruit foreigners through a government-owned employment service center. In order to enter Vietnam, a foreigner needs a visa issued by the Vietnamese Embassy or Consulate. A Vietnamese visa can be granted while in a third-party country or from within Vietnam. Citizens of Asian Pacific countries receive a free entry visa to Vietnam that lasts between 15 and 30 days. However, to work in Vietnam and remain for an extended period, foreigners need to apply for a longer-term three-month multiple entry visa. B4- For work at representative offices or branches of economic, culture, or other professional organizations of foreign countries, or work with a Vietnam-based non-governmental organizations. 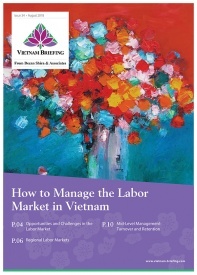 In most cases, a work permit is required when working in Vietnam for more than three months. Where a work permit is not compulsory, a notice must be submitted seven days in advance to the provincial Department of Labor, Invalids and Social Affairs (DoLISA) prior to working in Vietnam. Currently, work permits for foreigners are valid for a maximum of three years. Authorities are becoming more strict regarding work permits. Those who violate the regulations by working in Vietnam without a work permit may be penalized or, if unable to meet work permit requirements, deported back to their home countries. Coming to Vietnam to supply consulting services on tasks serving to research, build, appraise, monitor and evaluate, manage and process programs and projects that use Official Development Assistance (ODA) in accordance with regulations or agreements in an international treaty on ODA signed between an authorized Vietnam agency and foreign agency. Foreigners who hold work permits valid for one year or more, as well as senior management, can be granted a Temporary Residential Card (TRC). A TRC is issued by the immigration agency under the Ministry of Public Security, and will be valid from 1 to 5 years. People granted a TRC can enter and exit Vietnam without a visa within the valid terms of their TRC. Holders of a B2, B3, or B4 visa are eligible for a Temporary Residence Card, as well as members of management boards, members of councils and boards of directors, heads of company branches and Chief Representatives of representative offices of foreign enterprises in Vietnam. 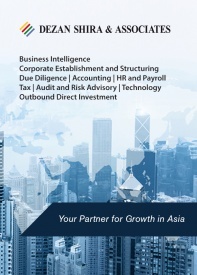 This article is an excerpt the September 2013 edition of Asia Briefing Magazine, titled “Work Visa and Permit Procedures Across Asia.” In this edition of Asia Briefing Magazine, we outline the specific documents required for foreign nationals working in across Asia, as well as highlight the relevant application processes in each country. Attention is also given to the role of the sponsoring company and the regulations they must adhere to. Accompanying each country’s visa and permit structure, you will find a complete list of the essential documents required when filing for permission to work abroad. For further details or to contact the firm, please email asia@dezshira.com, visit www.dezshira.com, or download the company brochure. Thank you for your question. It is possible to work at multiple schools at one time. However, you must carefully read over the contract that you will be signing with your first school. If they clearly state that you are a part-time employee, and that there are no legal ramifications from your working at additional schools, then you should be fine. Also, pay attention to the clause in your contract that states how long, if at all, your work permit will last once you stop working at the first school. It should be noted that regulations surrounding work permits are often, and seemingly arbitrarily, changed (for example please see here), therefore, pay close attention to any new and upcoming regulations. we are having few Chinese employees going to VN for supporting the set up of machines in a semi-conductor company. apart from the abovementioned documents, do we have to apply any other licenses i.e. export licenses for the employees so that they can work in the client’s factories lawfully? 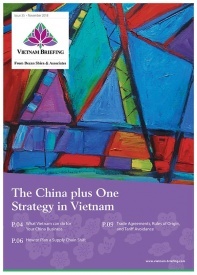 the concern is that there may be limitation of technology release in VN. thank in advance for your help. 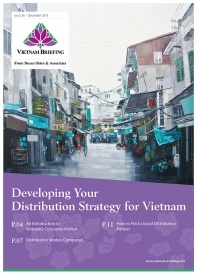 The next steps to support your Chinese employees coming to Vietnam will depend on the duration of their stay. I have sent an email to your registered account regarding this issue. Hi im fully trained chef and been working in the industry for lasst 15 years all around the world, im originally from new Zealand, currently head chef in nz. Im wanting to cook in vietnam but not sure about working visa. Im 31 years old, can you point me in right direction please. Im have heard that if I get 3month visa I can work for that period of time?. Thank you for the useful information. I am just wondering, would a person has difficulty obtaining a work permit in Vietnam because he/she had previously entered Vietnam on a 3-month business visa? Last year before the implementation of the new regulation on visa types, a foreigner can enter Vietnam on a business visa even without a job offer/business-related invitation letter. do you have a more up-to-date article regarding who is eligible and not eligible for resident permit with/without work permit? Hi; I was convicted of a traffic violation years ago (in Australia). Am I still eligible for a work permit in Vietnam? Please see your inbox for further details regarding residence and work permit eligibility. A foreigner who has previously obtained a business visa would not have difficulty obtaining a work permit in Vietnam as a result of this. Please see your inbox for further details. The traffic violation is not likely to prevent you from receiving a work permit in Vietnam. Nice guide that you have there. Is it still up-to-date meaning still currently implemented? In any case, can I ask for your advice regarding my situation? Currently, I have a job offer for a consultant role in Vietnam and the period will be at least 6 months. Can I just apply for a business visa (3months validity) and then go back to my home country and come back again so that I can reapply for another 3 months? Or is there any other options that is more preferred like applying for work visa so no need to go back and forth out of Vietnam? Hope to hear from you soon. Thanks in advance! 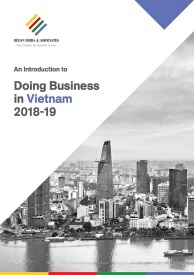 I’ve read that it’s possible to enter Vietnam on a 3 month ‘business’ visa and work for 3 months, with the option to renew the visa every 3 months. Is this info accurate? I’m struggling to find this info online elsewhere.. The three month business visa is an option for business trips. If you plan to stay in Vietnam for a prolonged period, we would be more than happy to assist you in obtaining a work permit and temporary residence card. Many thanks for your comment, and congratulations on your new job. In your situation, you would not be required to return to your home country, and could receive a new three month business visa in any Vietnamese Consulate or Embassy. Such visas may be extended within Vietnam in some circumstances. very helpful article indeed! great job! I will be assigned in Vietnam as a Commercial Director and at the same time the legal representative of the mother company from Singapore. We are now on the process of applying for business certificate as 100% foreign investment Enterprise in Vietnam. I saw in your article that foreigners like me who has this kind of position are exempted from needing a working permit. Can you validate this? if so true, how will I apply for the temporary residence visa? Is it automatic?